Whew! As you can see by our nearly completed To-Do List, we’re just about done. It seems like only last week that the 2nd #HAHD Marathon Challenge officially got started. It’s amazing how time flies when our Expert Authors are being incredibly productive. Congratulations to all of the qualifiers who diligently completed at least 100 articles in the designated 100-day window. If you’re one of the qualifiers, and you also submitted your prize request email, you should have already received an email acknowledging your achievements. Speaking of achievements, you should also be finding a FREE downloadable Certificate of Achievement on the main page of your member interface in the next few days. Click here to learn more about downloading and printing your certificate. The prize packages (mugs, mouse pads, hats and blankets) went into the mail today, so you should be receiving those soon as well. Allow several business days if you’re a U.S. author and a few weeks if you’re an international author. Finally, if you were a “First 100” qualifier, you are cordially invited to attend the private teleseminar hosted by Christopher Knight, Publisher and CEO of EzineArticles.com on Friday, December 4th at 11:00AM CDT. Watch your email for more details in the coming week. The next challenge begins at the very start of the New Year, 12:01AM CDT on January 1, 2010. It wraps up on 11:59PM CDT on April 11, 2010. Watch the Blog for more details in the coming weeks. Hopefully that covers everything. If not, feel free to leave a question or comment and we’ll do our best to help you out. Again, from all of the EzineArticles Team, congratulations! Thanks for the premium membership as part of the 2nd 100 articles in 100 days. The generosity of EzineArticles is very much appreciated. I am so excited that I was one of the First 100! YAY! What a blast this is and I love being part of EzineArticles!! Hi I never realised the 2 HAHD was on but now that I know when is 3rd one I will surely participate. However I wanted to ask one thing. Can I start writing now or do I have to start writing from 1st January. Please do let me know. I Love such contests organised by EzineArticles. The rules of the HAHD say that articles need to be submitted between the dates of the challenge. When those articles are written is up to you. Looking forward to the next marathon in Jan! Keep up the good work EzineArticles! Congrats to Ann and Meggin – proud of you guys! I am so excited. I am also one of the first 100 to qualify. Thanks everyone and thanks for all the prizes. Wow…Wow…Wow. Thankyou Chris and Crew for the terrific HAHD challenge and thankyou also for the terrific prize pack for being one of the first 100. Congrats to the winners of the Premium Membership winners! Well done! Chris, with the 3rd challenge starting in January will there be another premium membership draw on offer :-)? Thanks for the prizes. The mug looks great. Just received the Mug, Mouse Pad, Hat and Throw. Love the Red color. Thanks so much for the generosity from Chris and the rest of the Ezine staff. I received my HAHD package today! Just in time too because the blanket is coming in handy in Chicago today. Thanks! Ill be posting some pictures later and will update. 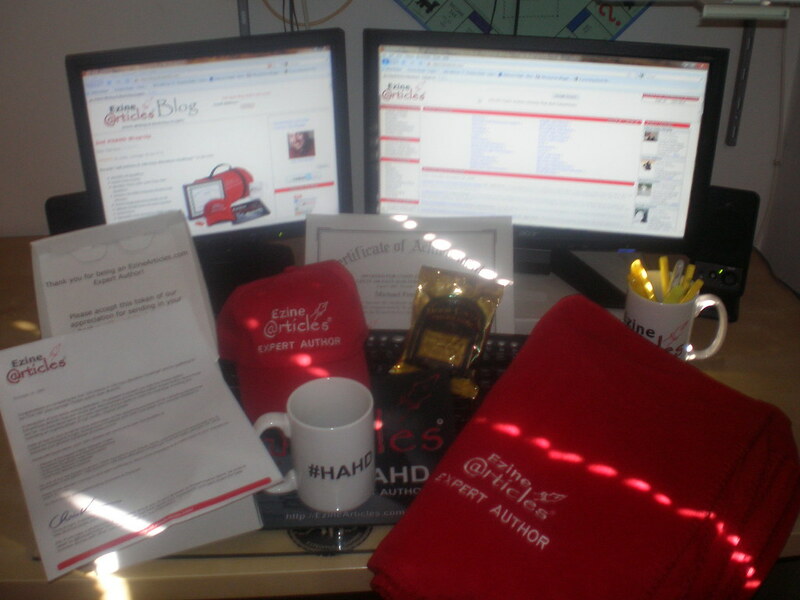 Here is the follow up picture of my #HAHD prize pack! Thanks Again! Thanks for the picture! We’re glad to see everything arrived safely – enjoy! I keep reading about quality articles in the EzineArticles newsletters, which seems to conflict with a contest where the incentive is to deliver 100 articles in 100 days. I wonder how much research, thought and analysis goes into the 100 articles in such a short time frame. It appears obvious that quantity is more desirable than quality with such a contest. I am surprised because I thought EzineArticles was more about quality. Anyone can write 1 quality article per day for 100 days. I hear what you’re really saying though and you’ll like the quality-required twist we have planned for the Jan 1st 2010 #HAHD contest. The HAHD package arrived today…. I initially thought it was a package from overseas and was going to wait until Christmas to open it. My kids demanded to open it (thinking it was for them) ….glad we did. A nice early Christmas gift. Thanks for the great prize pack (arrived today) and the premium membership! I’m looking forward to the next challenge starting in January — having a deadline is very motivational. 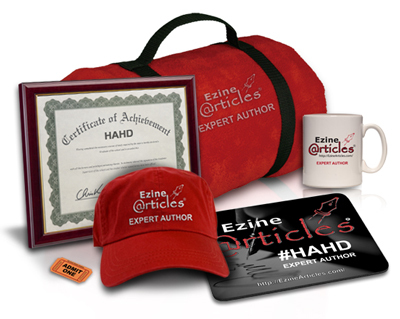 Here are two pictures of the #HAHD prize pack I received. Thanks again. Thanks for the note and pictures. It’s always fun for us to see pictures of the the prizes at their final destination. Enjoy and congratulations! Thanks very much for the terrific prizes which arrived safely in Queensland Australia today. What a wonderful surprise it was too but I won’t be needing the blanket for a few months yet ~ Today’s temp is plus 32. :-) Bit different from last year for me when it was a minus 32 in Canada….LOL…. I missed the starting date twice. But not now! Third time lucky? I really want that mug. I missed the HAHD challenge and I’ve sort of “picked up” that there’s another one about to start. Where can I get details? How do I sign up? I really need a new mug! Watch for details of the next #HAHD Marathon Challenge coming soon. I can tell you this: It starts at the stroke of midnight on January 1, 2010!